Group A Streptococcus (GAS), sometimes known as "flesh-eating bacteria," causes invasive infections that result in high mortality. GAS is susceptible to many antibiotics, but continues to cause devastating infections. 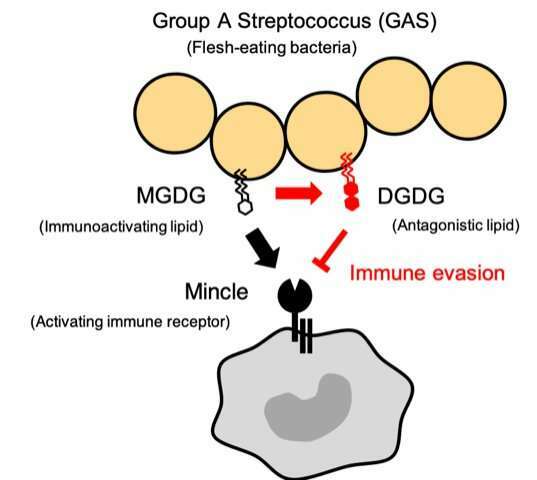 Many studies have attempted to understand the mechanism for immune recognition of GAS, but none has provided a clear explanation, until now. In a new study published in the Proceedings of the National Academy of Sciences (PNAS), an international research team led by experts from Osaka University investigated a variety of genes activated by the inflammatory components of GAS cells. They found that macrophage inducible C-type lectin (Mincle), an innate immune receptor, was strongly activated by exposure to these components.